What a venue! Red rooftop, a bell tower, authentic Mexican tile details, infinity pool dropping over the edge of the Pacific, lush gardens of buganvilla, and even a secret passageway - this location has it all! We love shooting weddings, bride & groom portrait sessions, engagements, and editorial shoots here. The oceanfront setting is made all the more dramatic by the rocky coastline and big waves (Cerritos is also a popular surfing beach). This image incorporates the powerful movement of the ocean, with a crashing wave in the left foreground that leads the eye to the bride on the rocky point. Chris shot this image from a reef exposed by the low tide using a Canon 5D Mark 2 and a Canon 16-25mm f2.8 wide angle lens. Hacienda Cerritos is located near the fishing & farming village of Pescadero, on the Pacific coast of Baja California Sur 65 kilometers north of Cabo San Lucas. 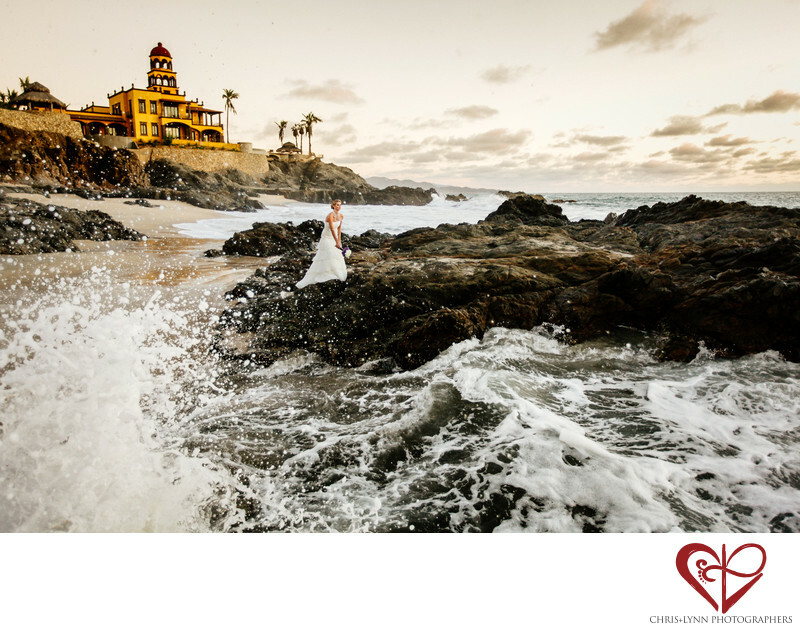 The hacienda is known as one of the top wedding venues in the Todos Santos area. This image was created during an editorial shoot for the luxury wedding publication Perfect Wedding Magazine, excerpts of which can be seen in the Press section of the Chris+Lynn website here. 1/400; f/2.8; ISO 800; 25.0 mm.